I wasn't really keen on visiting Petronas Twin Towers in Kuala Lumpur because taking architectural photos seem to be my waterloo in photography. However, my friend mentioned that there's a "free" bus from our place in Bukit Bintang that goes to Petronas. So I found myself riding the "Green" Line Bus and feeling really tourist-y. Actually, I didn't know that the last stop would be at the Petronas Tower, I just followed the other passengers when they all alighted. Here's my second glimpse of Petronas Towers. I'm glad that the speed of the bus is not that fast enough, just the right speed for me to take a snap. Then I alighted from the bus and followed the crowd to take some snaps but ended up riding the bus again because I left my friends in Bukit Bintang and we were supposed to meet for lunch. 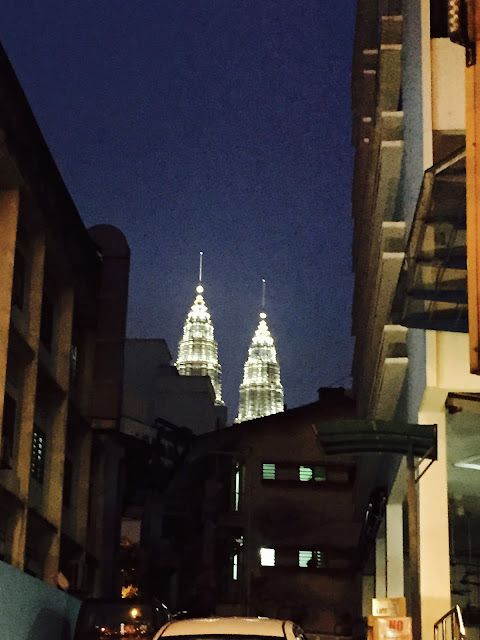 Here's my first sighting of Kuala Lumpur's famous twin towers taken in Bukit Bintang. Really wonderful to look at during nighttime. According to Wikipedia- Petronas Twin Towers held the distinction of being the tallest building in the world from 1998 to 2004. It has 88 floors, wow! Other buildings might have dwarfed it since 2004 but to this day, it still remains the tallest twin towers in the world. And here's my third time (my up-close-and-personal visit) to Petronas Twin Towers. This photo is taken somewhere near the Green Line Bus area. I wanted to take a wider photo but it was too hot and sunny outside so here's my only majetic-looking photo of Petronas. Luckily, the rain stopped a bit and I was able to capture this somewhat ethereal scene. 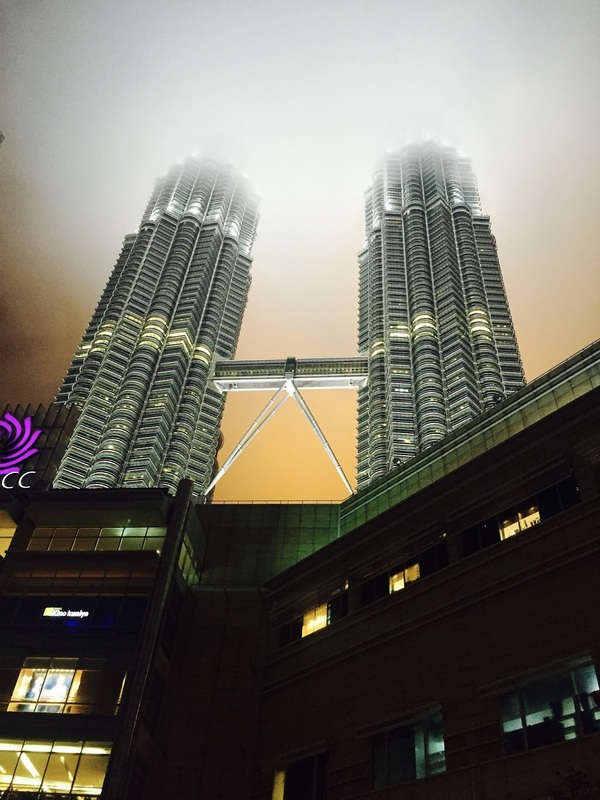 Breathtaking Petronas.